Robbie has been a must have in your side over the last two seasons. However all good things must come to an end and he has, for the first time, lost his forward eligibility. Should you still be picking him for the coming year or is his run in your team over? Check out Dunny’s thoughts as to whether you need Robbie in your side. After a stellar season in 2014, Robbie didn’t have quite as much impact in 2015. However, this could certainly be attributed to the poor form that the Power showed as well as having injuries to key midfielders Wines and Polec which meant that Robbie had to do more of the heavy lifting and was also targeted by opposition sides more. Whilst he didn’t seem to be as influential, he maintained his average from his breakout year at 96. He even increased it by 0.45. He also managed to win back to back John Cahill medals as the PAFC B&F for 2015. Whilst he did average under 100, let’s just have a little closer look at that average and a couple of games that affected it. Firstly there was the infamous game where he was knocked out by Bryce Gibbs in round 12 and was red vested with only 45% game time. He was also well below par in round 3 against North Melbourne after picking up a niggle against Sydney the week before. This niggle ultimately caused him to miss round 4, his only game missed for the season. So if we take those two games out and assume a fully fit Gray for the season his average becomes 99.94. Another key impact to his scoring last season was that due to injuries and poor team form he was required to play midfield more than he had the prior season. And this affected a key to his goal scoring. He scored 25.12 last year whereas in 2014 he had 42.33. In that season he was more of a forward who played in the mids and last season he was almost a pure midfielder (we will get to that in the next section). So if he can be let loose up forward with players like Wines and Polec back in the midfield then he can lift that goal scoring and hence lift his DT scoring to go along with it. The one part of his game that did appreciate a run in the middle was his tackle count. He lifted to 91 tackles (4.3 per game), a career high, his previous best was in the 2011 season where he had 84. With a fully fit side and more importantly midfield, he can get back to being that player he was in 2014 but he has learnt and should be able to elevate his scoring with more support around him and an easier draw for Port than they had in the last two seasons. Look for him to play a little more up forward than last year which could lead to him re-gaining his DPP status and be able to be in your forward line (in AFL Fantasy and Ultimate Footy only of course). There is that big elephant in the room and that is the fact that Robbie, for the first time in his career, can’t be selected as a forward. As a forward he is a must have, but as a pure midfielder a lot of questions start to be raised about him. When compared to other midfielders this year he has only the 40th best average. This is a huge concern. Added to that is the fact that he has never broken the 100 average per season mark which may come as a surprise to some people given how good he has been. We have only seen him has great from a scoring sense because we have been comparing him to forwards, where he was a must have. In Real Dreamteam he is priced in the same range as guys like Joel Selwood and Marc Murphy who both had down years by their standards and are expected to bounce back into the upper echelon of midfield scorers. Oh, and did I mention that he is also more expensive than some other guy you may or may not have heard of called Gary Ablett Jnr? So he is up against some stiff competition at his price range and with extra players back in that midfield for Port does this mean that he now spends less time in the middle and will need to rely on kicking goals to get his points? Goals that will be looking to be scored by a plethora of forwards like Schulz, Westhoff, Wingard and new boy Dixon. King – Despite the fact he hasn’t averaged over 100, he has won a Coaches Association award and two B&F’s in the last two years, so he has to be considered a king. Fitting him into your side will be the trickier bit. If you are going to put him in he will be someone that you are looking at to have a breakout in scoring. What we need to see is the same production of points as last year but with the goals of the season before. Can he do it? Well yes he can as he is a fantastic player. Will he do it? Who knows. This could well be determined by other factors like who is injured at Port this year and how the team is performing. I think a key will be to watch his role in the pre-season as well as the early weeks if you don’t start with him. I am predicting him to have a points jump, but I can’t see him jumping to the 110+ average that we want to see from our midfielders. If he gains Forward eligibility in AF at any stage of the season then he is a must get. If you do own him, he is an exciting player to watch so you can certainly enjoy the knowledge that you will see a highlight at least one a week from him, hopefully it comes with plenty of points attached! At this stage he isn’t in my starting squad calculations, but if he starts to get on a roll then he will be a big chance to come into my team. 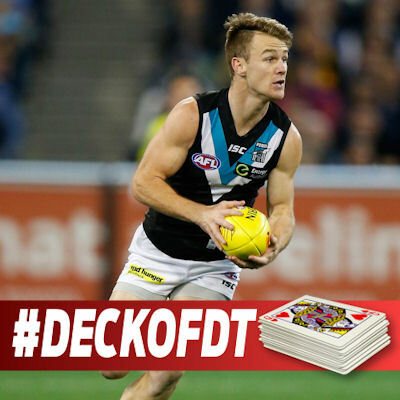 Does Robbie Gray pick up forward eligibility at all in 2016? If he gets FWD back I’ll get him in the week it happens, absolutely not worth a mid spot however.